According to the IMF report, Qatar experienced the biggest growth in house prices at 15.5 percent, followed by New Zealand with 14.6 percent, Hong Kong with 14.18 percent, Sweden with 13.74 percent, Hungary with 10.92 percent, Turkey with 10.48 percent, Ireland with 9.05 percent, Australia with 9.03 percent, India with 8.61 percent, and Israel capping out the top ten with 7.37 percent. Out of 60 nations, Ukraine recorded the weakest house price growth at -35 percent, behind the United Arab Emirates, Russia, and Brazil. House price growth in New Zealand was much more than similar developed nations such as Australia at 9 percent, the United States at 5.9 percent, and Germany at 4.2 percent. The IMF report also measured national median house prices compared to median incomes, with New Zealand topping 30 other countries with a 123.9 index score after 2010 results are given an index of 100. This was more than Austria in second place with 122.2, followed by Germany with 120.1, Sweden with 118.5, Luxembourg with 113.3, Estonia with 112.9, United Kingdom with 111.9, Switzerland with 110.9, Canada with 110.2, and Australia with 109.1. Japan and the United States were a bit further down the list at 103.7 and 103 respectively, with Spain in the bottom position with an index of 75. Housing affordability is an ongoing issue for New Zealanders, with first-home buyers finding it harder to own a home than ever before. While the accepted standard for housing affordability is three times the median household income, or about $230,000, the actual median house price in New Zealand is $490,000, a multiple of more than five. While these national figures might seem excessive, they're nothing compared to the price of housing in Auckland's North Shore and Queenstown-Lakes where the mid-price property is 10 or 11 times more than the median income. Strong house price growth can also be seen in the house price to rent ratio recorded by the IMF, with New Zealand once again in second position worldwide with an index of 126.6. According to figures from the Household Economic Survey, home ownership rates in New Zealand continue to widen depending on income brackets, with the top 10 percent of income earners recording a 5.17 percent increase in home ownership between 2007 and 2015, and the bottom 10 percent recording an 18.67 percent decline. According to Economist Shamubeel Eaqub, house prices in New Zealand have increased substantially relative to income since the 1990s: "Home ownership has been falling since '91. 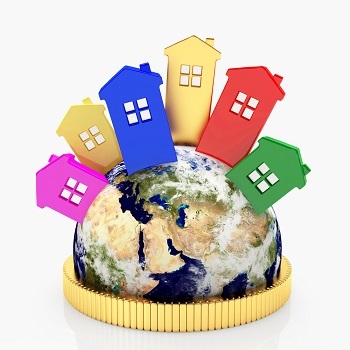 It's reducing affordability and has been pushing more and more people into renting... The pace of growth is just so far from income and savings it can't keep up for new entrants. For first-time buyers it's increasingly hopeless... Houses in most parts of New Zealand are relatively affordable but the job options are in Auckland."